Designed to blend seamlessly with any décor, the eco friendly black and ultra clear Lumiere glassboards simply communicate, naturally. Frameless tempered glass is borderless with polished edges and rounded corners to create a clean, uncluttered and ultra modern appearance. Boards can be mounted horizontally or vertically. Black colour with ultra clear 'starphire' glass - standard glass has a slight green tinge to it due to the iron oxides. This helps eliminate any colour distortion. Available in a choice of sizes. FREE pack of fluoro markers with each black glassboard. 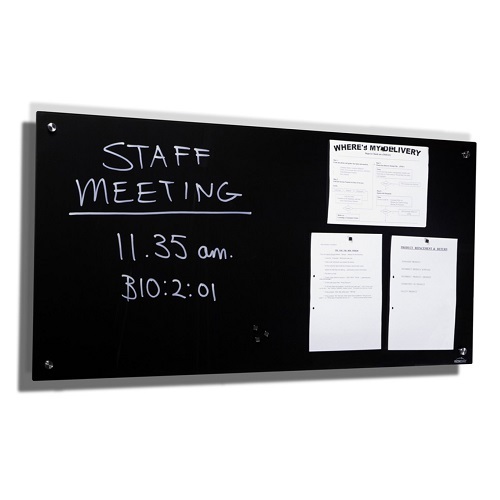 Supplied with chrome fixtures, which float the board 20 mm off the wall, and clear perspex pen tray. Ideal for use in hospitality, or any environment where you need to make an impact!